Advantages of Custom Metal Signs The most pervasive element of any business, institution or public space is the ubiquitous signages or signboards. 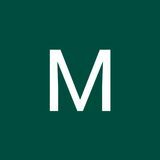 These signages are crucial and indispensable to businesses and public alike. That being said, we do not want much fuss around it and we expect it to stay for a lifetime, once installed, along with all the other virtues of style, durability, versatility and affordability. 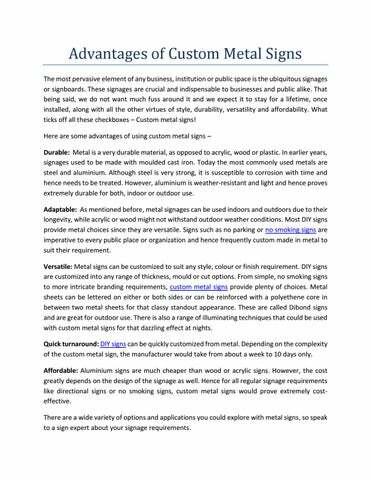 What ticks off all these checkboxes â&#x20AC;&#x201C; Custom metal signs! Here are some advantages of using custom metal signs â&#x20AC;&#x201C; Durable: Metal is a very durable material, as opposed to acrylic, wood or plastic. In earlier years, signages used to be made with moulded cast iron. Today the most commonly used metals are steel and aluminium. Although steel is very strong, it is susceptible to corrosion with time and hence needs to be treated. However, aluminium is weather-resistant and light and hence proves extremely durable for both, indoor or outdoor use. Adaptable: As mentioned before, metal signages can be used indoors and outdoors due to their longevity, while acrylic or wood might not withstand outdoor weather conditions. Most DIY signs provide metal choices since they are versatile. Signs such as no parking or no smoking signs are imperative to every public place or organization and hence frequently custom made in metal to suit their requirement. Versatile: Metal signs can be customized to suit any style, colour or finish requirement. DIY signs are customized into any range of thickness, mould or cut options. From simple, no smoking signs to more intricate branding requirements, custom metal signs provide plenty of choices. Metal sheets can be lettered on either or both sides or can be reinforced with a polyethene core in between two metal sheets for that classy standout appearance. These are called Dibond signs and are great for outdoor use. There is also a range of illuminating techniques that could be used with custom metal signs for that dazzling effect at nights. Quick turnaround: DIY signs can be quickly customized from metal. Depending on the complexity of the custom metal sign, the manufacturer would take from about a week to 10 days only. Affordable: Aluminium signs are much cheaper than wood or acrylic signs. However, the cost greatly depends on the design of the signage as well. Hence for all regular signage requirements like directional signs or no smoking signs, custom metal signs would prove extremely costeffective. There are a wide variety of options and applications you could explore with metal signs, so speak to a sign expert about your signage requirements.